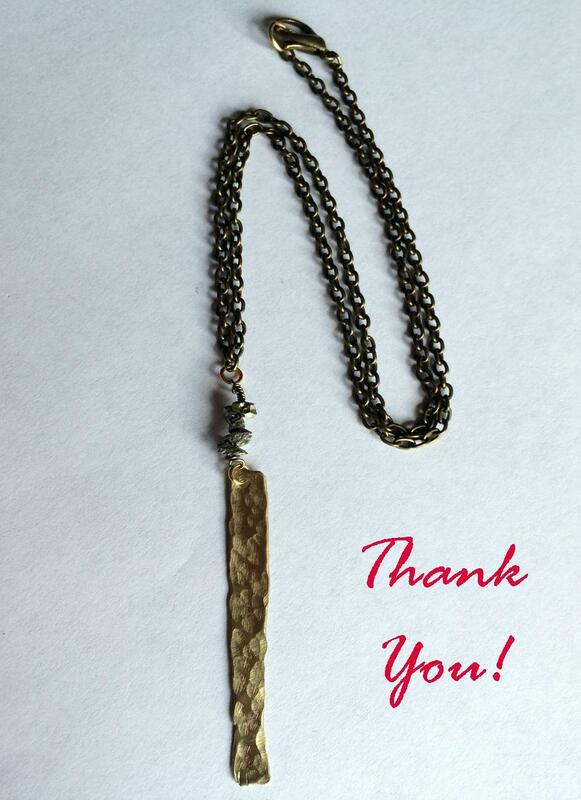 A Special Holiday Thank You! I must say I was very blown away this Holiday Season. Wow!!! This was absolutely the busiest Holiday I’ve had since I established The Pink Locket and opened up my Etsy store in 2008. A week ago I was putting Aiden in his car seat and he heard the “Cha-Ching” sound go off on my phone. With a confused look on his face he says “Mommy what’s that sound?” I said, “That means we got another Etsy Sale! Yayyy!” and he smiles. This Holiday was full of surprises indeed, not only did The Pink Locket make record sales, but I was able to partner with amazing individuals like blogger Courtney Creer of Believe In Style on a giveaway. In addition, I was able to work with Kabbage and Modani Furniture and create blog posts and fashion mood boards. Considering The Pink Locket is a one woman show (smile), I work full- time, have a husband, raising three wonderful boys and two dogs (yes they require attention too), and I peg away at DIY projects – that’s not too shabby I’d say. I’d like to take this time out to say THANK YOU to all my customers, new and old. You continuously help me to strive to do better and be better, whether it’s challenging my limits as a jewelry designer or business woman. There are times when I get frustrated and feel like hanging up my wire cutters, but you motivate me to be better not just with The Pink Locket, but in everything from my career to personal life. I hope you have a wonderful Holiday and many blessings and positive vibes to you in the New Year. Also, if you’ve placed a jewelry order prior to 12/16 you should receive your order shortly, if you haven’t already. All orders placed on 12/16 and after will not be received until after 12/25/14. 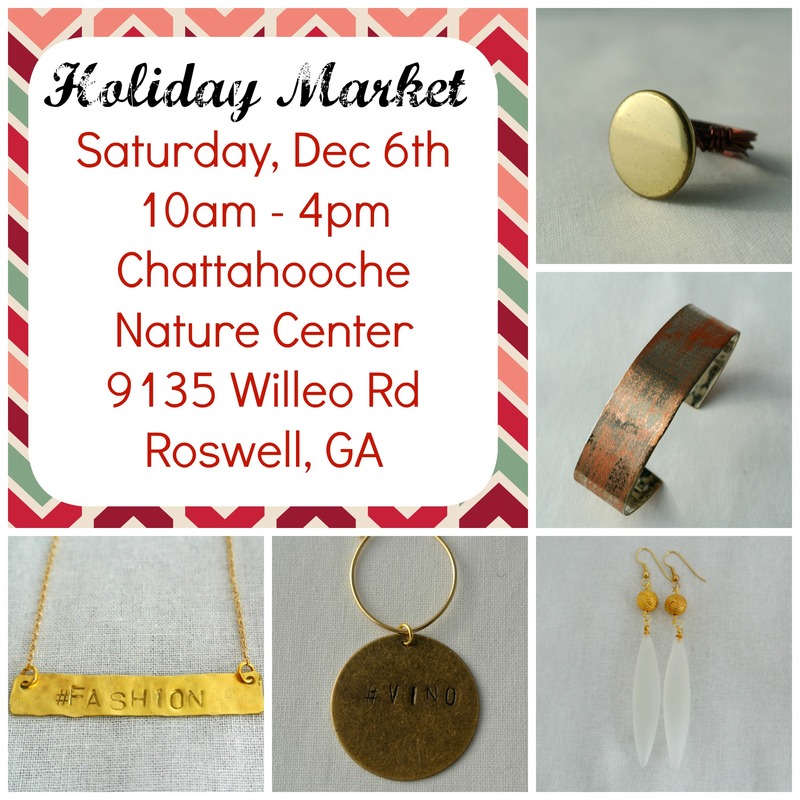 Mark your calendars for this Saturday, December 6th and come visit the Chattahoochee Nature Center and shop at its Annual Holiday Market. You’ll find some really nice and unique Holiday gifts for those on your list. In addition, the Nature Center is FREE for the family. If you missed our sales during Black Friday, Small Business Saturday or Cyber Monday you can still get 25% off your orders if you come out to the Holiday Market. This will be our last sale for the Holiday season. We can’t wait to see you there! 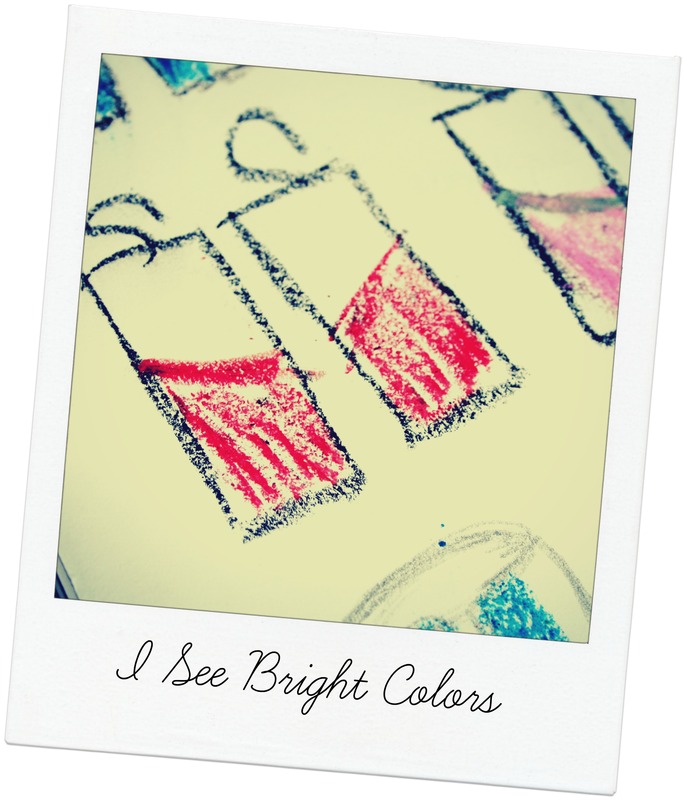 The Holiday shopping season is here and orders have began rolling in here at The Pink Locket. Be sure to check out our Holiday cut-off schedule to ensure enough time for your deliveries. If you’re in the Atlanta metro area, we’ll be on site at the Chattahoochee Nature Center’s Holiday Market on Saturday, December 6th from 10am-4pm, so come on and visit the nature center and get some Holiday shopping out of the way from fellow local businesses. The nature center is also FREE that day, so be sure to bring the family. Also be sure to check out “Jewels of the Week!” Every week we’ll feature a different item from our store that will be sold at near wholesale price (40% off) for that week only. This week’s item is our Geometric Floating Cuff Links. On Sunday (November 23rd) we’ll feature a new item. Every year it seems like we blink and the Holiday Season is upon us, then we blink again and it’s gone. A month long of celebrations and shopping will take months of preparation. Running an online jewelry business planning for my Holiday Season shoppers takes about 6 months. 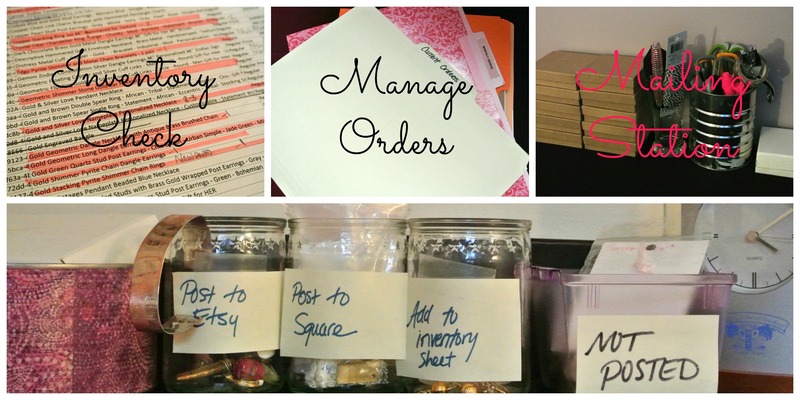 Here are some of the components I use when planning for a busy holiday shopping season. Before I spend money on anything related to the Holiday Season, from buying supplies for new designs to spending money on ads I sit down and create a detailed budget. Besides for tracking my monthly expenses on an Excel spreadsheet, I also create a budget specifically for the Holiday Season. Some of the expenses I list on my budget are Supplies for Holiday Jewelry Collection, Marketing, Holiday Show Fees, Personnel, and Additional Postage. I create 2 columns one labeled “Budgeted” and the other “Actual,” this allows me to track my actual spending and to see how close I’m getting to what I’ve budgeted. Majority of the time I’m a one woman show, but around the Holidays I tend to do more on site shows and need to put aside capital for vendor fees and personnel to help out. Kabbage is actually an excellent resource to gain additional funding this time of year to help out in these areas particularly. Once my budget is set I can begin planning out the rest of the season. I start creating the jewelry pieces around July and they are usually posted up online by August/September. For this year’s Holiday Collection I was inspired by pyrite stones (also known as fool’s gold). I found a way to work the stones into my metal designs and came up with pieces I think my customers will like. My marketing plan for the Holiday Season is always extremely detailed since it’s the biggest shopping time of the year. When creating my marketing plan I also keep in mind that I’m competing with big retailers as well. I design handmade jewelry, so having deeply discounted items are just not feasible or financially friendly to my bottom line. However, this gives me a chance to brainstorm and get crazy creative. 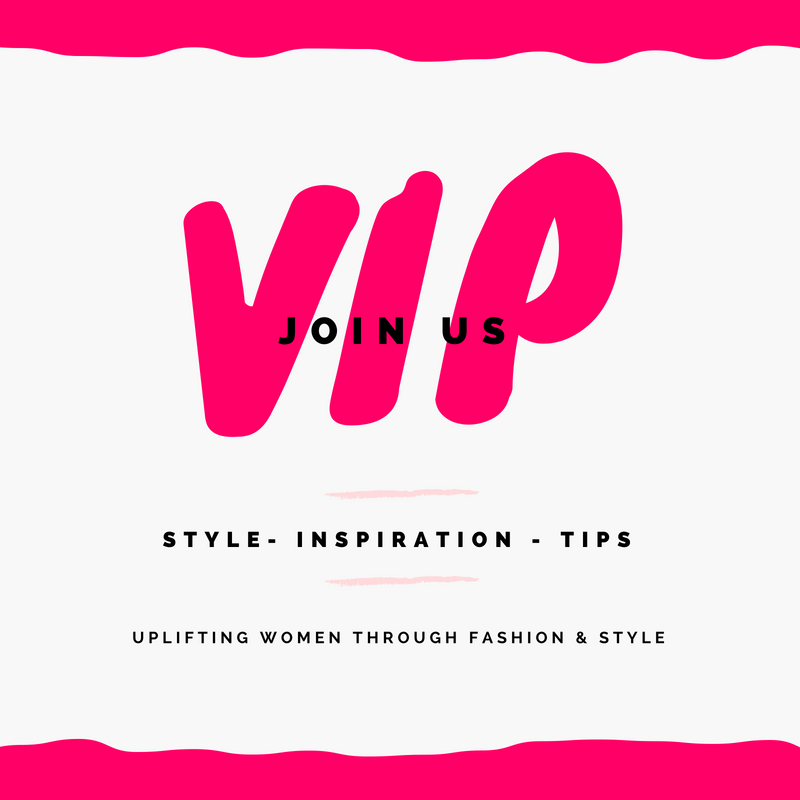 For example, this year I’ve created a Holiday DIY Style Gift Guide where once customers sign up to my list they’ll receive the gift guide as well as access to coupon codes and sales I’ll be having throughout the Holiday season, Holiday Party Looks and other great Holiday centric ideas. I use this time to not only attract new customers, but interact with current ones as well. Pinterest and Instagram are also major platforms in my marketing strategy. Last year I did an Instagram giveaway contest called “Holiday Party Attire” where users would post pictures of their Holiday Attire with a particular hashtag and got a chance at winning a jewelry item from my shop. This year my big push is “Jewelry Item of the Week” where each week for the next month customers can receive that item near my wholesale price for that week only. Last week it was my Hand Stamped Wine Charms and this week it’s the Geometric Floating Cuff Links for Men. Running a sale like this allows me to remain profitable, but gives my customers a chance to try something new as well in my shop.